When I was in high school, I was fascinated with World War II. I took a class on World War II and I guess my fascination continued into college because I majored in history and I took another course on World War II. I watched all 26 episodes of the World at War series (1973–74) on PBS several times. The thing I remember most clearly was the face at the end of the closing credits. The face was gaunt and mostly shadow. Deep dark shadows filled the hollows of the eyes and cheeks—especially the eyes. It was a haunting face, especially with the music and the flames which accompanied it. I never turned off the TV until I saw it. I think it was the face of a person from a concentration camp. The other thing I remember about that show was the episode called “Genocide.” This episode ends with the implementation of the “Final Solution.” It was the first time I saw the bulldozers. You know, the ones that were pushing heaps of emaciated bodies… The episode ended with the music and the flames and the face. I’m not sure exactly what the attraction to World War II was all about. Part of the draw could have been something like a fourth grader being interested in dinosaurs. But I think a lot of it stemmed from puzzlement. I watched the shows and read the books to try to find something to help me make sense of it all. Episode 20, “Genocide,” only increased my confusion and fascination. I now think that this confusion was rooted in the gap that existed in my own mind between the idea of the Holocaust and the physical reality of the Holocaust. Knowing and thinking are not the same thing. I had ideas about the Holocaust, but I didn’t know about it. The Anne Frank Museum didn’t bridge the gap. Maybe that’s the museum’s fault; it works so hard to create a universal significance that the particularity of young girl is lost. Perhaps it’s my problem because I universalize everything. Then I went to Dachau. Dachau bridged the gap. It was the prototype on which all the other camps were based. Intending to spend a couple of hours; my wife and I stayed for more than six. It was at Dachau that I realized that concentrations camps weren’t built out of ideas like racism, anti-Semitism, National Socialism, evil, hate or the scapegoat mechanism. 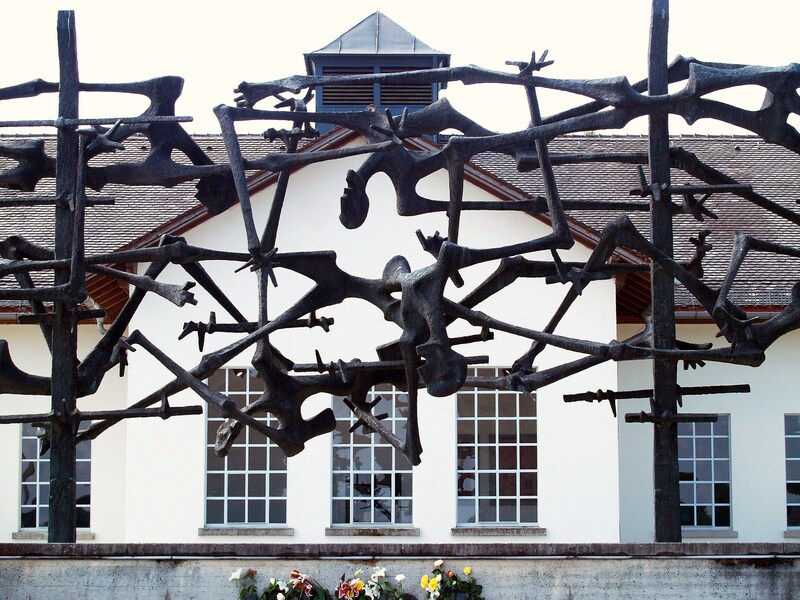 Dachau was built out of concrete, barbed wire, and wood. I know that doesn’t sound like much of a revelation, but it is! Before that visit, the Holocaust was an abstract concept; that day it became concrete. The men who ran the place were made of flesh and blood and their boots wore out the tile in the interior hallways. The prisoners were defined by an iron gate that I strolled through. I stood where they stood for roll call on freezing winter mornings in thin, striped, tattered uniforms. When the idea of the Holocaust is linked with the physicality of Dachau, it becomes real in a profound way. 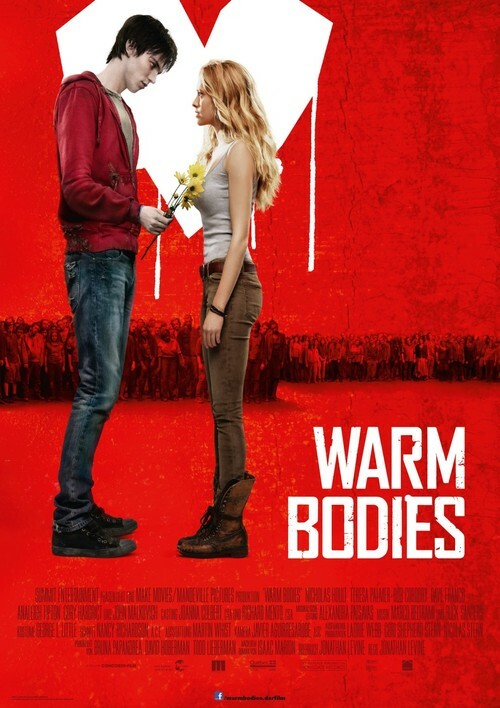 Like the book, the movie, as social commentary, suggests the modern-secular self is already largely zombie. Early in the film, R walks through the airport with a bunch of zombies sitting around or bumping into each other. He recounts an earlier, better time, when humanity meaningfully interacted with others—the scene shows an airport full of people absorbed by their electronic devices bumping into each other like zombies. This desire is reflected in his collection. R collects a lot of things, and, from what we are shown, everything reflects this craving for connection. Every slide in the stereoscope shows a boy interacting meaningfully with a girl. The snow globe he acquires on the same excursion on which he acquires Julie presents lovers holding hands on a footbridge. And all the songs we hear from his record collection are about missing someone. The connection issue is shown in the community of the Living as well. Their major project involves the construction of a huge wall to separate the Living from the Dead. Lead by Julie’s father, the Living strive for the symbol of division. Like the figures in the snow globe, R and Julia supply the bridge between the Living and the Dead. When the zombies see R and Julia holding hands, they are profoundly affected–the cure has begun. R describes the effect of the gesture when he says, “Julie and I were giving the others hope.” All this is a lot of fun. I enjoyed the movie, but, sadly, they resorted to mere convention. This is where, disappointingly, the movie takes a significantly different approach to the cure than does the book. In the book, romantic love is metonymy; it is one of several things that represents all things transcendent, like beauty, soul, and mystery. Not so with the movie; here the cure is simply romantic love. All the indicators of “true love” are present: hand holding, kissing, accelerated pulse, the inability to look away when her shirt is off and taking stupid risks, not to mention a literal balcony scene. This is not a surprising solution to the zombie problem. Mainstream movies almost always solve all their problems with romantic love. It is able to overcome all barriers of social class, age, race and ethnicity, and personal conflicts. Why not overcome death? I was a little disappointed at this, for it seems like a cheap solution, especially when the book offered romantic love as one of the means, rather than the end in itself. Where the book hints that we need to recover of a view of reality beyond philosophical materialism, the movie suggests romantic love is the solution to all our problems. This is not to condemn the film, I actually enjoyed it, it just means it is a romantic comedy — and little more. You know you’re an English teacher, if, when a movie is released, you buy the book. 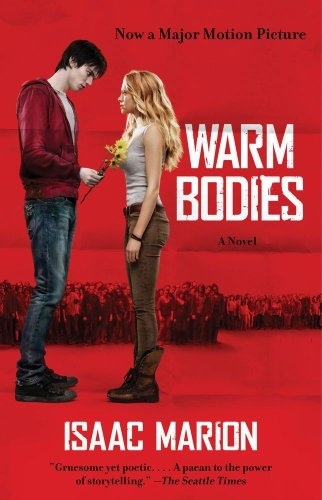 The cover of my version of Warm Bodies by Isaac Marion is the movie’s poster, but it is better than a silly romance which cover seems to suggest. The book’s first-person narrator is R — it’s all he remembers of his own name because he’s a zombie. The undead always have identity issues. We do what we do, time passes, and no one asks questions . . . . We grunt and groan, we shrug and nod, and sometimes a few words slip out. It’s not that different from before” (4). This is one of the main themes of the novel, suggesting that, in many ways, people are like zombies long before they become the decomposing brain-eaters. Its source is not any direct divine judgment per se, but because we’ve “crushed ourselves down over the centuries” (221). I think we crushed ourselves down over the centuries. Buried ourselves under greed and hate and whatever other sins we could find until our souls finally hit the rock bottom of the universe. And then they scraped a hole through it, into some … darker place. In the last few centuries, we have crushed ourselves, indeed all of reality, down into the very small container of matter only–material reality is reality. We have rejected all transcendence: anything beyond the physical. We have come to believe the world is ruled by immutable and impersonal laws, that humanity is just a bunch of genes trying to get ahead and that time is a mindless and purposeless march toward personal and cosmic oblivion. This view of the world could be called “Philosophical Materialism.” It holds that matter is the only reality and that everything, including thought, feeling, consciousness, and will, can be explained in terms of matter. The world described by philosophical materialism is closed to the transcendent. This idea has crushed us. We’ve largely lost our sense of mystery and little evokes wonder. More and more of us believe that everything from mountains to sunsets, from music to love, is a product of physical or chemical processes. We no longer value things for their own sake, but for how economically useful they are–trees have become lumber and pigs have become pork. It is just a matter of time when people will be valued only for their utility. Or has this happened already? The book asks, if this is our conception of reality, what then is the difference between being a zombie or one of the Living? Julie doesn’t see a lot of difference anymore. While looking at a daisy Julie says, “We don’t even have flowers anymore. Just crops” (70). We don’t even have flowers anymore. Just crops. Julie believes that human beings are no better than zombies if they lose their sense of wonder — when they cease to see the world and its inhabitants as beautiful in and of themselves. Her father, only concerned with practical survival is no longer any better than the Dead he hates. She says of him, “Dad’s dead. He just hasn’t started rotting yet” (202). Julie believes life is more than physical and that simple survival isn’t enough. She says, “I mean obviously, staying alive is pretty . . . important . . . but there’s got to be something beyond that, right?” (71). Julie is a foil to her father’s limited participation in life, but her vitality also provides a more important contrast to the Dead, represented by R.
Julia is less than impressed with R’s stagnant music collection. He communicates that he isn’t really looking for anything different–that’s the way the Dead are. She doesn’t accept this as a valid excuse claiming, “Music is life! It’s physical emotion–you can touch it! It’s neon ecto-energy sucked out of spirits and switched into sound waves for your ears to swallow. Are you telling me, what, that it’s boring? You don’t have time for it?” (54). Julie’s love of music, like that for flowers, is rooted in their transcendence–they possess qualities beyond their physical properties. She is unique in that, unlike her father or the zombie R, she believes that there is more to reality than the physical. This, it turns out, is salvation for R.
Romantic love is a part of his salvation, but it’s much bigger than love. It includes flowers and music and everything else that human beings experience. All the things that are good or true or beautiful, supernatural, spiritual or transcendent things. “I look into Julie’s face. Not just at it, but into it. Every pore, every freckle, every gossamer hair. And then the layers beneath them. The flesh and bones, the blood and brain, all the way down to the unknowable energy that swirls at her core, the life force, the soul, the fiery will that makes her more than meat, coursing through every cell and binding them together in millions to form her. Her body contains the history of the universe, remembered in pain, in joy and sadness, hate and hope and bad habits, every thought of God, past-present-future, remembered, felt, and hoped for all at once” (222). In Julie’s face, he sees the transcendent and it is inseparable from the physical. This has always been true of everything, he just forgot–this is the essence of the zombie. Somewhere in the last few centuries, we have separated the soul from the body and then ditched the soul because we couldn’t weigh it. We lost the enchantment in life. The novel’s thesis is that if you live long enough in a disenchanted world, you will eventually become little more than a zombie. It offers a solution too; this story suggests that the first step toward the cure of the zombie curse is the re-enchantment of the world. The movie made one significant change to the story. Should we ban the use of he pronouns “you,” “I” and “me” in our praise and worship songs? Of course not, but the songs we sing on Sunday are full of them and they shouldn’t be. They reveal how we understand God and others and the world, but they also reinforce the self-centeredness that comes so naturally to us. Rather than lead me into a reality where I am not the centre of the universe, many songs carry the same message as television commercials. Let’s start with “you.” There is no inherent problem with this word. But there is something we’ve lost along with the word “Thou.” It’s not really the word “you” that’s the issue, but a tone of familiarity and intimacy that I am wondering about. I think some of our songs consistently reflect an intimacy which might be going a little too far down the continuum, toward the “Jesus is my girlfriend” extreme. On one level, the intimacy is appropriate because the Holy Spirit is within us. But we can’t lose the idea that we are also addressing the almighty creator and sustainer of the universe. As for “I” and “me”–one of the main idols in our culture is individualism and we are hardly aware of our ritualized devotion to this false god. In the West, everything comes to us through the filter of individualism. It would be a very good idea for every Christian to become very intimate friends with someone from a non-individualistic culture (traditional African and Middle Eastern perhaps) and listen very carefully to how they understand the Bible. I am barely aware of my own devotion to the god of individualism. But I catch a glimpse of it in many praise and worship songs. Worship should be God-focused, so it follows that worship songs ought to be focused on God and not on me. So then the question is, how often ought we see the pronouns “me” and “I” in song set? Notice that even if I am singing a line that says, “I love Jesus,” I am still singing about myself, or more accurately, my feelings. Keith & Kristyn Getty & Stuart Townend wrote a song called “Come People of the Risen King” which is sung as a people of God, rather than a person of God. 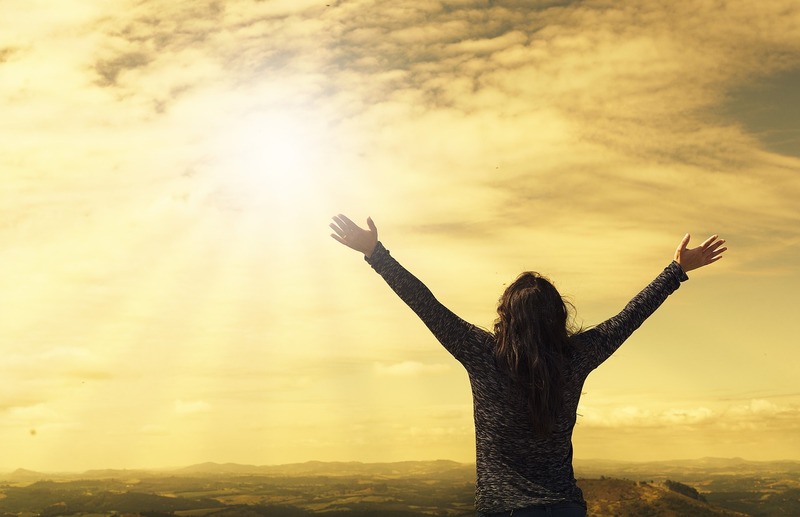 I am suggesting that when we are selecting songs to sing in collective worship, we need to primarily focus on God and not ourselves or our feelings toward him. This shift in focus will be reflected in the pronouns.